Above: Louise Currie in the B-mystery Second Chance (Wurtzel Productions, 1947). Unlike most serial actresses, Louise Currie was not a former model or beauty pageant winner–but she was still a very attractive girl. Again unlike most serial heroines, Currie received considerable training as a dramatic actress–but this background didn’t make her disdainful of serial melodramas. Instead, she tackled her serial roles with enthusiasm, imparting an air of level-headed bravery and warm, easygoing friendliness to her serial heroines; Currie’s characters seemed the sort of girls who would be equally at home at a country dance or in a war zone. Although her starring career in serials was limited to two chapterplays, the popularity of those chapterplays and Currie’s own charming personality have made her better-remembered by fans than many leading ladies with longer serial careers. Louise Currie was born in Oklahoma City, Oklahoma. She became interested in acting at an early age, and attended the famed German director/producer Max Reinhardt’s acting school in Hollywood after finishing college. Once her theatrical training was completed, she began a career in Hollywood. Her first movie role was the female lead in the Bob Steele B-western Billy the Kid Outlawed (PRC, 1940), while her third screen appearance was in the Universal serial The Green Hornet Strikes Again (1940). Her part in this initial cliffhanger outing was small and uncredited; she appeared in Chapter One as the unnamed hard-boiled girlfriend of Bordine (James Seay), a hit man hired to kill Britt Reid/The Green Hornet (Warren Hull). In 1941, Louise was offered a contract by Columbia Pictures’ boss Harry Cohn after co-starring with Charles Starrett in the Columbia B-western The Pinto Kid (1941), but she turned the offer down, preferring to work as a freelance actress instead of a contract player. Above: James Seay and Louise Currie in The Green Hornet Strikes Again (Universal, 1940). Also in 1941, Currie signed on for her first starring serial, Republic Pictures’ The Adventures of Captain Marvel. Based on the adventures of a Fawcett Comics super- hero, Marvel starred Frank Coghlan Jr. as Billy Batson, a young radio broadcaster who accompanied an expedition to Siam. There, in a sealed tomb, the expedition discovered an ancient device called the Golden Scorpion, which could be potentially world-threatening in the wrong hands. Batson was chosen by the tomb’s ancient guardian Shazam to protect innocent people from the device’s dangers; Shazam gave Batson the power to change into the invincible Captain Marvel (Tom Tyler) by uttering Shazam’s name. Billy then found himself forced to use this power in order to keep a masked villain (calling himself the Scorpion, naturally) from getting his hands on the powerful Golden Scorpion. 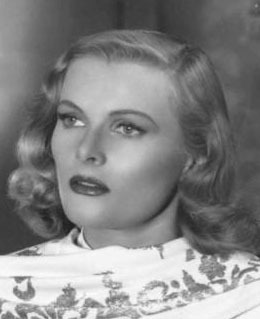 Louise Currie played Betty Wallace, the expedition’s secretary, who aided Billy’s efforts to investigate the Scorpion’s gang, but was unaware of Batson’s secret identity. While most of the expedition members had brought their danger on themselves by their insistence (despite dire warnings) on excavating the Golden Scorpion, Louise’s character served as a representative of all the innocent people in the world who would be threatened by the device’s powers. Currie’s warmly likable personality helped her fill this function perfectly; she also established a very convincing rapport with co-stars Frank Coghlan Jr. and Billy Benedict (as Coghlan’s sidekick Whitey). Adventures of Captain Marvel was a big success for Republic, and remains perhaps their most popular serial. It was full of good things, including the performances of Coghlan and Tom Tyler, excellent special effects, and varied locations. Louise’s performance, despite sharing screen time with all these memorable features, has also remained a fondly-remembered element of the serial. Above: Louise Currie confers with (from left to right) George Pembroke, Frank Coghlan Jr., Robert Strange, and John Davidson in Adventures of Captain Marvel (Republic, 1941). Above: Tom Tyler as Captain Marvel has just rescued Louise Currie from a car crash in Adventures of Captain Marvel. After Captain Marvel, Louise continued her career as a freelancer, playing leading or supporting roles in various B-films, including B-westerns (Tim Holt’s Dude Cowboy and Gene Autry’s Stardust on the Sage) and comedies (she made three appearances in comedian Harry Langdon’s Columbia shorts). She also had bits in bigger-budgeted films, including Orson Welles’ Citizen Kane. She returned to Republic Pictures for her second and last starring serial in 1943; the cliffhanger in question was The Masked Marvel, a wartime spy-fighting adventure. The Masked Marvel was a mysterious figure whose identity was unknown to both the characters on-screen and the audience; he combated a Japanese sabotage ring masterminded by the slithery Sakima (Johnny Arthur) with the aid of four insurance investigators and the daughter of a murdered insurance company executive. Louise, of course, was the last-named character, Alice Hamilton; she was the only one aware of the Marvel’s true identity, and she served as the spy-fighter’s most valuable ally. The Masked Marvel featured an incredibly swift pace, an incredible array of action and stunts, memorable villains, and good stuntwork from Tom Steele, the man behind the Marvel’s mask although not one of the “suspects” for the hero’s identity. The four actors who made up this group of suspects were rather dull and uninteresting, while the Masked Marvel himself was an enigmatic figure who only showed up for action sequences. The good guys’ side needed a skilled and endearing performer to boost the audiences’ interest, and Louise Currie was just the girl for the job. Her energy brought a needed sense of urgency to the investigators’ strategy- planning sessions, and her serious, respectful relaying of the Marvel’s orders to the team increased the character’s aura of mystery. The Masked Marvel is another highly-regarded Republic cliffhanger despite its admitted weak points; Currie’s performance is the principal reason those weak points didn’t have a greater impact on the serial. Above: Louise Currie and Tom Steele in The Masked Marvel (Republic, 1943). Above, from left to right: William Forrest, Louise Currie, Bill Healy, Rod Bacon, Richard Clarke, and David Bacon in The Masked Marvel. Louise worked in Hollywood throughout the 1940s, playing leading roles in B-films like the Bela Lugosi horror movie The Ape Man and the Hopalong Cassidy picture Forty Thieves, and bit parts in major films like the Gene Kelly/Deanna Durbin picture Christmas Holiday. In 1948, she married actor John Good, and in 1952, she made her final screen appearance in an episode of Hal Roach’s anthology TV show Fireside Theater. She and her husband then began new careers, as an interior decorator and architectural designer, respectively. They worked in tandem to build, design and decorate houses, and this new business proved a highly lucrative one, causing the pair to abandon the acting world permanently. Currie continued making serial-related public appearances, even after entering her nonagenarian years; her last was in 2010, when she hosted a screening of Adventures of Captain Marvel in Beverly Hills. Three years later, she passed away in California at the age of 100. Louise Currie was definitely lucky to win leading roles in two of Republic’s most popular serials–but it was charm and talent, not luck, that helped her make the most of both roles. In Captain Marvel, her “girl-next-door” affability was perfect for her interaction with Frank Coghlan Jr., while in Masked Marvel, her seriousness and sincerity helped make the audience feel that the fate of America’s defenses really did depend on the Marvel’s group. Despite the brevity of her serial filmography, Louise Currie definitely earned her place in the affections of serial fans. Above: Louise Currie in publicity stills from Adventures of Captain Marvel (left) and The Masked Marvel (right). Acknowledgments: B-movie expert Tom Weaver’s Internet Movie Database biography of Louise Currie provided me with the biographical information in this piece. You sure you got the date of birth. From what I’ve read she hit 100 today. Thanks for catching that mistake; I’d heard about Louise Currie’s hundredth coming up, but didn’t stop to think that it contradicted the date I’d been using. My source for the old date was the Internet Movie Database, which is frequently wrong (I see that the IMDB has now changed the birthdate to April 7, 1913, though–it looks like Tom Weaver, who always knows what he’s talking about, has corrected it there). I’ve corrected it above too; many thanks. The Oklahoman newspaper had a detailed obituary of Louise Currie on September 15, 2013 under the name ‘Louise Currie Gunter Good’. Her first husband was Oklahoma oil man Robert Hefner, Jr. His Wikipedia article contains an anecdote of a pregnant Louise going into labor while attending a White House dinner during a snowstorm.